Housing enforcement officers have always been at potential risk of verbal abuse and physical violence from members of the public. Frontline housing officers carry out a range of highly sensitive work, such as collecting rent arrears and dealing with anti-social behaviour and sometimes very ‘intense’ neighbour disputes. They often have to deliver unwelcome messages, perhaps turning down a housing application, or a request for a repair which is the resident’s responsibility. I strongly believe that concealable or overtly worn stab resistant vests can help protect these professionals when being attacked by those expressing their anger via physical action. However, recent reports also show the number of pre-eviction notices soaring by 26% across UK social housing. In fact, one in every 105 households in England is at risk from repossession or eviction, new statistics have revealed. Housing charity Shelter’s research found ‘hotspots’ around the country where the chance of family losing its home is even higher. In Nottingham and Luton, one in 60 homes are at risk, whilst in Salford one in 61 is threatened. In both Newcastle upon Tyne and Wolverhampton one in 63 homes is at risk. But the area where the threat of eviction or repossession is highest is the London borough of Newham, where as many as one in every 35 homes is at risk. Shelter’s helpline is currently taking over 470 calls a day, offering support and advice to homeless families and those fighting to stay in their homes. With housing costs soaring and welfare cuts continuing to take their toll, the charity is bracing itself for a record number of calls this Christmas. But who is dealing with most of the tenants who are either genuinely unable to honour their financial commitment of paying the due rent and also those tenants who simply cannot be bothered to pay the rent and those who simply feel they should not pay anything at all…. society in general or indeed the government owes them one? Who will the bearer of bad news, verbally engage with some potentially disrespectful, intoxicated and truly hostile tenants, and who will at the end have to take the necessary physical action of evicting the tenant? In simple terms it will most likely be the Housing Enforcement Officer. The question we need to ask ourselves is what can and should be done to create the highest possible chance of these housing officers coming home at the end of their shift… unharmed? In a survey of 200 social landlords carried out by the Chartered Institute of Housing’s journal Inside Housing, a shocking total of 8,898 assaults on front-line housing staff were reported between January 2009 and April 2012, but please let us not overlook those assaults that remain unreported for whatever reasons. “The research also reveals the number of assaults that occurred between January 2009 and the end of March this year. There were 8,898 verbal and physical assaults reported by housing staff of the 223 organisations that responded to our requests – roughly eight a day across the UK. There are a number of reasons a widely reported increase of assaults on frontline housing staff. Firstly, there is increased pressure on residents as a result of the global financial crisis and the difficult financial situation many are in. This causes stress, which, some people express via verbally and physically aggressive action towards anyone who they perceive as being unhelpful or ‘not understanding enough’. Housing Managers, led by the Health & Safety Managers, will conduct internal surveys, re-evaluate risk assessments, potentially make lone worker security devices available and stress the importance of really good training in conflict management and conflict resolution. I personally feel very strongly that all of the above is truly essential, especially efficient and effective training delivered by someone who REALLY knows what he/she is going on about is just crucial. However, we also need to understand that a lack of adequate safety measures can put an individual at unnecessary risk, and cause unacceptable injury or harm. Stab Resistant vests have therefore regrettably become a real necessity within Housing Associations and are worn by frontline housing staff in several countries. 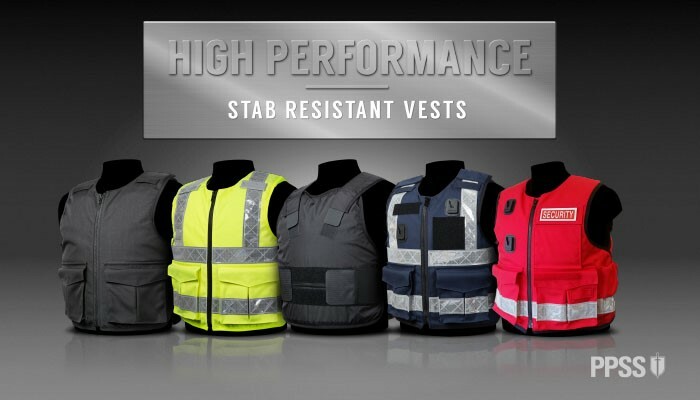 PPSS Stab Resistant Vests (Body Armour) offer the highest level of protection from edged weapon, hypodermic needles and blunt force trauma. Weighing just 2.5kg and being just 5mm thin this type of personal protective equipment (PPE) has recently become an essential tool to combat workplace violence related injuries and even death. PPSS Groups’ high performance stab resistant vests are available as COVERT, OVERT or HI VIZ OVERT model. Yes, I do agree… the risk of being shot or stabbed is not as high as some news writers might want to make us believe. However, the risk of someone ‘overreacting’ to you or your colleagues because YOU are just in the process of disconnecting the water, gas or electricity supply, the risk of someone taking aggressive physical action against you because YOU are trying to collect money/rent that person is not able or willing to hand over, or the risk of some ‘overreacting’ and willing to harm you simply because you are not willing or unable to solve their long lasting dispute with their much hated neighbour is a very REAL risk! When such situation arises and when such person is calling you all the ‘A’, ‘B’ or ‘C’ words in the world and is throwing the first punch… a body armour can make a real difference. A body armour will allow you to focus entirely on two objectives… your escape or your defence of your head… because it will be your body armour that will take care of your vital organs, your heart, your lungs and your kidney… and everything else hidden within your rib cage. It is without question that Council’s Housing Rent Arrear Officers will have their work cut out dealing with these tenants, with some indeed being polite, respectful and reasonable… however some being hostile, intoxicated and abusive.